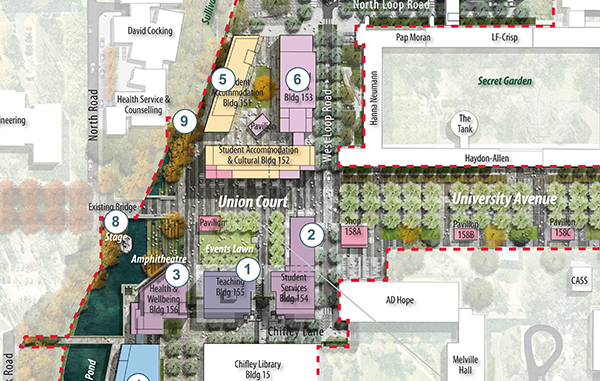 Fenner Hall will likely move to Union Court in 2019, in a new, low-cost building next to Sullivan’s Creek. The ANU appears to have scrapped plans to move Fenner to SA5, the building currently occupied by Bruce, after community backlash, and hopes the Union Court building will keep down costs and preserve Fenner’s off-Daley-Road culture. Fenner residents advocated against the proposed Daley Road move. “I think they underestimated how strongly we felt,” explained Sean Ding, 2016 Fenner Resident’s Committee President, recounting the residents’ reaction to the announcement. “It was like, did he just say what I think he said?” While initially committed to the move, by the end of 2016, ANU delayed the relocation, promising it would not occur before 2019. 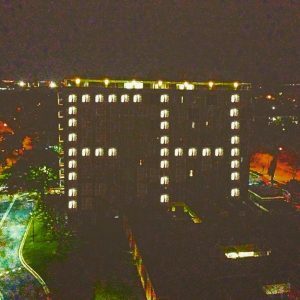 This delay, and a promise of further consultation, were a result of many factors, including residents submitting letters and illuminating the Fenner building with the iconic “FH”. Ding argued important aspects of Fenner Hall should be preserved, such as affordability and the unique off-campus position. Without an option such as Fenner, he said, “a lot of students wouldn’t be able to come to university.” Currently, residents pay around $220 per week. Last year, ANU said rents would increase by approximately $50 per week, which Ding said was “unreasonable”. Current FRC President Victoria Xia said that “affordability is definitely an issue, and I think it’s something we’ll need to tackle as we go along,” explaining that at the moment her focus was on “helping design a hall that supports a collegiate community.” She believes, however, that a rent increase is “unfortunately unavoidable”. The ANU said in a statement that the Northbourne site needs a “substantial investment of more than $12 million for maintenance and upgrades,” and that “given the high costs, it makes sense for the University consider other options”. Xia said students proposed finding another location off-campus, but “they [the University] said it would cost too much.” Xia explained it seems their options are SA5 or SA7 (in Union Court) and that she prefers the latter. Xia acknowledged that moving from off-campus to the heart of Union Court is “very daunting”, but argued it would be better for Fenner to maintain its non-Daley Road identity. She also hopes to maintain Fenner’s links with businesses on Lonsdale St and in Braddon.